Taco salad is delicious, but often doesn’t have enough vegetables to be labeled a ‘salad’. Add that most taco salads are loaded with dairy laden ingredients, and it is one salad often off limits to those who need to eat dairy free. Dairy Free Taco Salad with Avocado-Lime Dressing upgrades this dish with plenty of fresh vegetables and a rich, tangy dressing so creamy you’ll never miss the dairy. Serve layered or toss all together with a side of Cilantro Lime Rice to round out the meal. Vegetarians can double the beans and heat them with the seasoning mix used to cook the meat in the recipe for a colorful vegan meal. Our family also adds salsa, left over cooked veggies, and likes to serve with fresh mangos. The sweetness of the mango is a nice counterpoint to the spicy savoriness of the salsa and salad. YUM! Combine all avocado, first measure of olive oil, lime zest, lime juice, and garlic cloves in a blender. Process until smooth. Add cilantro and water. Blend until smooth. Taste for seasoning to see if dressing needs more salt and pepper. Cover and refrigerate dressing until ready to use. In a skillet, combine oil, beef, cumin, paprika, chili powder, oregano, salt and black pepper. Cook over medium-high heat until cooked through and no longer pink. While meat is browning, drain and rinse beans. Add beans to skillet when meat is cooked through, stirring until combined. Cook bean mixture until beans are heated through, then turn off heat. If you have not done so, cut up lettuce, bell peppers, shallots, tomato, and olives. To assemble salad, make layers of lettuce, pepper, onion, tomato, bean and beef mixture, and olives. 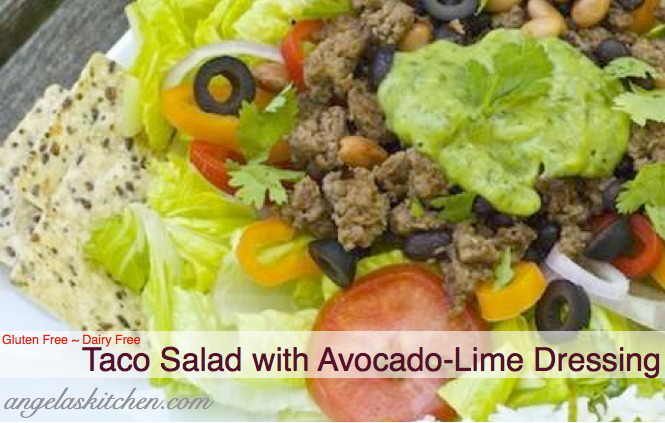 Top salad with avocado dressing and garnish with additional chopped cilantro, if desired. 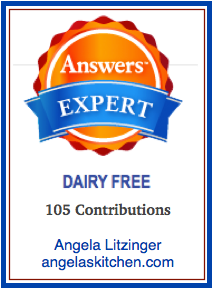 Edit: this recipe was later tweaked and added to the dairy free category on answers.com when I was coordinator of the dairy free category. That version serves 4.